Medical bills are the No. 1 cause for personal bankruptcy in the United States. Even with Obamacare, some people just can't pay them. This is because medical bills are, after a house, potentially one of the biggest expenses you can encounter in a lifetime. But it's possible to negotiate oppressive medical debt down, freeing up money that should be going toward personal savings and other daily expenses. Here's how. "I used to work on the other side, denying people's claims," says Adria Goldman Gross, a medical bill advocate with MedWise Insurance Advocacy. These days, however, she's in the business of helping people lower their medical bills, which Gross believes are often unreasonable or even predatory. "It really makes me angry," she says. One of her cases involved a family of six, with one wage earner making $60,000 a year. A hospital forgot to take down the person's insurance information during a medical crisis, adding $23,000 in bills atop the $27,000 paid by the insurance company. "How can you expect them to pay this?" Gross asks. After some hard horse trading -- the kind Gross does every day in her new role – the company finally settled for a face-saving additional $600. Gross believes the easiest cases to settle are ones you just can't pay. "If I can prove they can't afford it, that's the easiest," she says of her clients. There's a simple question when considering the massive expense many people incur just by setting foot into a hospital: Can you actually afford to pay the bill? Don't be too proud to say "no." Then negotiate from that perspective. Mike Sullivan, director of education with nonprofit credit counseling service Take Charge America, says companies' medical billing has changed a lot in the past few years. "They used to be very easy to negotiate with, but times have changed." Sullivan used to tell people to just not pay medical bills when times were tough and to concentrate on other areas of their finances. Not so anymore. These days, he believes it's important to get out in front of medical bills and contact a health provider as soon as you think you might have a problem paying. "Before they send it off, they're usually willing to negotiate," he says of the companies -- something that is especially true if patients negotiate before getting a procedure. Even afterward, though, a company knows how much it costs to put an account into collections and would rather reach an agreement than pay a collection agency to go after it, Sullivan says. Because of attractive financing terms, you might want to negotiate down your payments rather than the total bill. 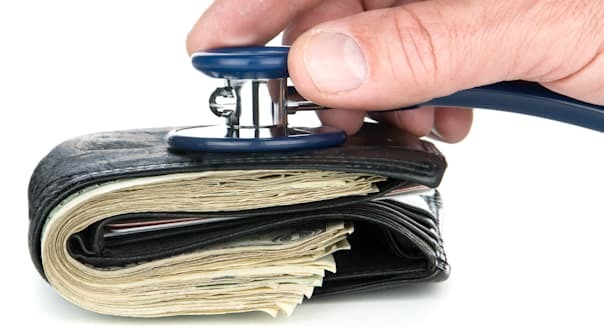 Leslie Tayne of the Tayne Law Group, who represents lots of clients with their medical providers, says it's important to negotiate both in terms of the total and the monthly payment -- another area where an inability to pay is an asset. "There are times when you just can't get blood from a stone," she says, stressing like Sullivan that it's far easier to negotiate the earlier in the process you are. While you might feel your health providers are crooks that charge too much, Sullivan urges you not to say so. Instead, make sure they see you kindly, and as a person rather than as a customer. "Make it personal," he says. "Tell them you're experiencing hardships." It's also good to research typical prices for a procedure so you go into the process armed with knowledge. Knowing the "reasonable customary charge" can give you a very strong pair of legs to stand on when you negotiate -- even if you're still on crutches.